It’s October, which means pumpkin-spiced everything, changing leaves and Halloween. Just because it’s time for all things spooky, it doesn’t mean your wardrobe needs to be scary too! Check out the fall trends Stylist Alexandra O.’s loving for ghouls girls this month. 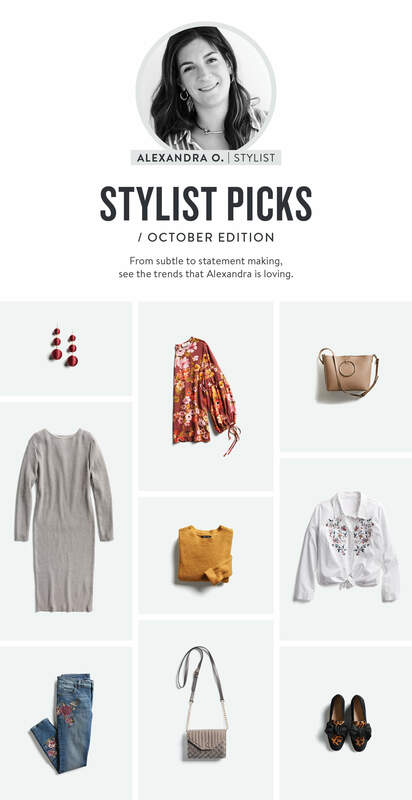 See the October picks our Stylist, Alexandra, is most excited about! Statement earrings: Dainty jewelry is perfect for everyday wear, but if you’re going for the wow factor, opt for shoulder-duster earrings in jewel toned colors like burgundy or cobalt blue. On the hunt for something a little more versatile? Try big gold hoops (they go with everything!). Fall florals: They’re a fun alternative to everyday stripes while infusing a poppy punch of color to dark fall outfits. Modern handbags: A structured purse can elevate any outfit. Details like shiny hardware and geometric shapes stand out from the rest, even when they’re in a neutral. Sweaterdress: A one-piece knit will be your new seasonal staple. Pair it with fashion sneakers while we transition into the cooler months or slip into a pair of tights to keep cozy. Comfy sweaters: Whether you’re lounging around the house or out on a coffee run, throw on a cozy sweater with leggings or jeans. Embroidery: Whether the stitched detailing is on jeans or a classic button-up shirt, the festive threads add a subtle pop of color to any outfit. Updated denim: Punch up your fall sweaters and booties looks with a pair of not-so-basic jeans. Test the waters with embroidery, an exposed button-fly or front-seam detailing. Velvet: The thick, luxurious fabric will help keep you warm, as well as take you in the holiday season. If you’re on the fence about this throwback trend try it as an accessory first—like a cross body bag or a pair of shoes. Animal print shoes: Turn any minimal outfit up a notch—go with polished flats or pumps to take you from work to happy hour. 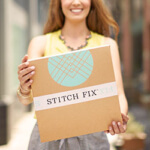 Learn more about how our online personal stylists can send you the freshest looks.